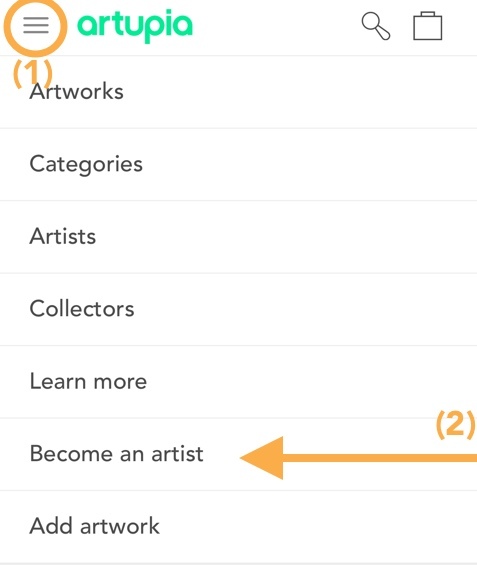 You can register as an artist going to our home page and pressing the orange button “Become an artist”. After the artist registration is completed, you can go to the home page press the button up on the left "add new artwork”. You can register as an artist going to our menu (1) and pressing the button “Become an artist” (2). After the artist registration is completed, you can go to "My Collection" and press the button “Made Artworks” to find the orange button “Add Artworks”. You can register as an artist going on “My collection” (1) and pressing the button “three squares and a +” up on the right (2). Here you can insert all the information required to become an artist.